It’s been 6 years since I released a CD! hard to believe how time flies, but it was 2007 when I released ‘Under’ upon my return from Australia. Sabine (my wife) and I run our own music production company, so actually, I’ve (helped) put out many CDs over the last 6 years – just not my own (this includes 3 ArtemesiaBlack CDs with Sabine, so sort of mine I guess…). Seems my own music sort of got set aside to help others, but last year, I began to notice I had quite a few new songs recorded – stuff I’d been working on in between client work. I also noticed that I had several songs from previous CDs that had never been released and that didn’t really fit genre-wise with the new material, so I was thinking multiple releases. 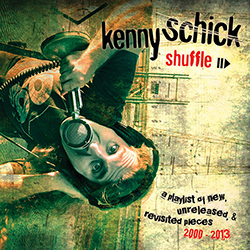 Then I got the little brain worm – seems as though so many folks listen to iTunes in ‘shuffle’ mode, so why couldn’t I release a CD with ‘unrelated’ material and just make it a ‘playlist’ of Kenny music? I also realized there were songs from the first 4 albums that hadn’t really gotten too much attention and that were never finished off quite to my liking, so I thought this could be a retrospective as well. So it all started to come together in the form of CD #5, ‘Shuffle’. The new songs are obviously just ‘new’, and the unreleased songs were mostly from the ‘Fuzzyland’ album which was released in 2004 – they were cool songs, but Mike Freitas (who played drums on that album and helped me co-produce) and I decided they didn’t fit, so they sat incomplete until last year. The very first album, the 2000 release ‘Eating The Cannibal’ was a super limited release, and it was one of my favorites of all the albums being so experimental and being my first ‘child’. That album was started in the second of 3 basements that were my studios in the early years (thus Basement 3), and recording for that disc started some time in the early or mid 90’s. It was recorded to a single black face ADAT(8 tracks, bouncing, yadda yadda). I was very happy that the machine (after an initial error message) actually started and played the VHS tapes so I could get the material into Pro Tools….phew!! ‘Rising’ which was completed in 2002 was my first Pro Tools recorded album, and I was just never fully happy with that disc, though it got good reviews. ‘Fuzzyland’ came along in 2004 and was a ‘success’ in my eyes, with help from Mike Freitas, Gordon Gurley, and Jerry Ososkie. The first 3 albums had all sorts of great musical contributions from so many folks I’d played with over the years, but there was never a band to support them and there were never CD releases for any of them because of this. It was after the release of ‘Fuzzyland’ that I started to seriously realize that I needed to play live shows to support my ‘children’, but having tried to put together bands a few times earlier, I decided to see if I could do it as a solo act, and thus started the more singer-songwriter approach that so many of you are familiar with in regards to my performances. The solo acoustic thing was a lot more difficult and life changing that I ever imagined it might be: playing with a band, as I had always done, was one thing, but being responsible for the whole ‘thing’ was another, and I quickly realized that my singing, with the inability to do multiple takes in a studio, was a problem. I’d also never really loved the sound of my voice, as I’d learned to sing in really loud bands/situations, so producing a knife-like cutting sound was the result to get through all the volume, and that was just not a tone that really worked for me as a lead singer. I took voice lessons and studied acoustic guitar players for a year before I ever did a ‘show’, and the first shows were pretty rough by my estimation. As 2006 rolled around, I’d started to get the hang of it and the song writing had taken a direction that reflected the performance format, but it was not quite standard singer-songwriter fare. Later that year, I ended up in Australia as many of you know to meet Sabine and play music. With a lot of time to work on my craft, I came up with some methods of playing acoustic guitar that made it sound a little more like multiple musicians, and recorded the majority of what would be the CD ‘Under’ on a mini recording rig I brought down with me. This is also the time that the first ArtemesiaBlack album was born, and Sabine and I started playing together. Upon returning to the US, I played a lot of solo shows and even toured the west coast a few times, and then toured the whole US when Sabine arrived on our shores in 2008. Then the mobile recording I’d started in Australia ended up being the start of our music production business as I began recording other artists in the fashion I’d always recorded my own albums. Still heavily influenced by all the acoustic music I’d heard during those years, I did begin to record some new material here and there, but I began missing some of the more layered instrumentation of my earlier approach, so some of that has crept it’s way back in just a little…. : ) As far as songs from old releases that appear on ‘Shuffle’, they have been re-sung and remixed to sound more like I’d always imagined them. And here we are in 2013 with me trying to remember how to play my songs in preparation for a CD launch. I am very happy with how this CD came out and I hope you will all enjoy the variety and quality of this release – it is sonically the best thing I’ve done (as i now mix/produce constantly), and though I tried to make this CD purposefully ‘shuffle-like’ in it’s odd song to song relationships, I am surprised, actually, at how coherent it ended up sounding.